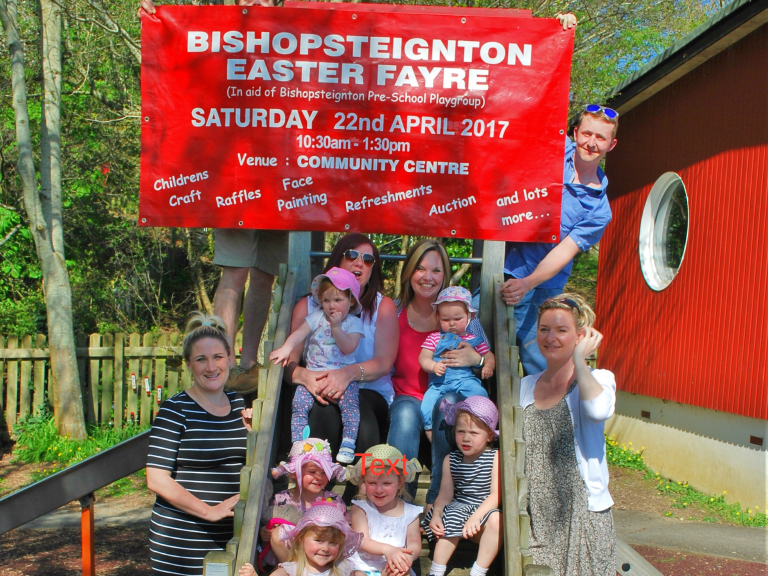 Bishopsteignton Pre-School, an entirely self-funding playgroup, is hoping for a record-breaking Easter Fayre on Saturday 22 April, when children and families from across Teignbridge converge on the Bishopsteignton Community Centre to celebrate a tradition that stretches back over 25 years. Starting at 10.30am and running through to 1.30pm on Saturday 22 April, the Bishopsteignton Pre-School Easter Fayre, which is free to enter, will have a bouncy castle for small children, face painting, games and competitions as well as plant stalls, tombolas and much more besides. Old favourites will include splat the rat, sun flower seed growing, toy stalls and Easter mask-making. There’ll even by cream teas, cakes and refreshments to keep everyone happy. The Easter Bonnet Parade will see a fantastic array of creations on display. The parade, seen as the highlight of the Fayre by many, takes place at midday with prizes for the best Bishopsteignton Pre-School bonnets in a range of age groups. This will be followed by a raffle and a grand auction featuring an outstanding range of items donated by businesses across Devon. All money raised will go to the upkeep of the school and its facilities. Auction items include dinner for four at ODE True Pizza in Shaldon, two signed copies of Laura Wall’s children’s books Goose, and a Sharpham Wine and Cheese tour voucher for two, which includes the chance to try Sharpham’s award-winning cheeses and four of Sharpham’s finest wines. Other prizes include iBounce tickets, bed and breakfast at The Passage House hotel, a fruit and vegetable box from West Country Fruit Sales, a family ticket on board the South Devon Railway, a pair of tickets to Dartmoor Zoo and even a trip in an original DeLorean time machine, decked out with its own flux capacitor for that ‘Back to the Future’ experience. All auction items will appear on the Bishopsteignton Pre-school Facebook page, where full details of the donated prizes can be found alongside information on how to bid for items if you can’t make it to the Fayre in person. Commenting on the Bishopsteignton Easter Fayre Kate Reddaway, part of the organising committee, said: “We’re really looking forward to this year’s Fayre. We’ve got some fabulous high value auction items, a great selection of prizes for the raffle and brilliant entertainment throughout the day for children of all ages. The Bishopsteignton Easter Bonnet parade has taken place in the village for over 25 years. In the past, it used to wend its way through village collecting donations from onlookers on the way. Today, the parade takes place at Bishopsteignton Community Centre, where a host of entertainment and fun activities has been organised for children of all ages. Bishopsteignton Pre-School would like to thank all local business that have provided items for the Fayre including Jack’s Patch, the Theatre Royal Plymouth, Teignbridge Leisure, Paignton Zoo, Shute Fruit and Produce, Redrock Brewery, Old Walls Vineyard, Sharpham Wine & Cheese, Underground Passages (Exeter), Tumbling Teds, Harbour Fish Bar, South Devon Railway, Blue Anchor, Teignmouth Coop, Kents Cavern, Powderham Castle, Lemon Jelli, On The Waterfront, ODE True Pizza, Laura Wall, Moving Pictures, Armada Building Solutions, Dartmoor Zoo, Shaldon Zoo, Passage House, West Country Fruit Sales and iBounce.